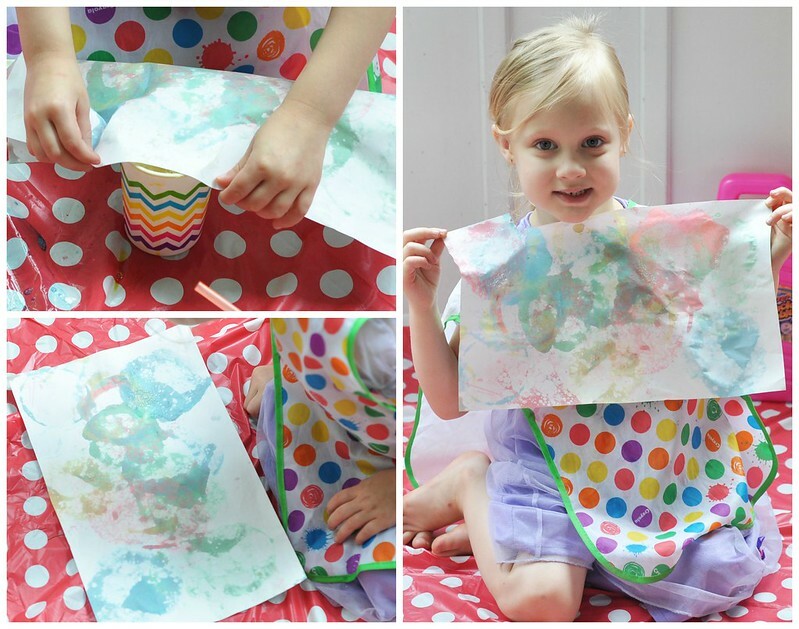 Bubbles + Food Coloring + Paper = A fun activity for kids! 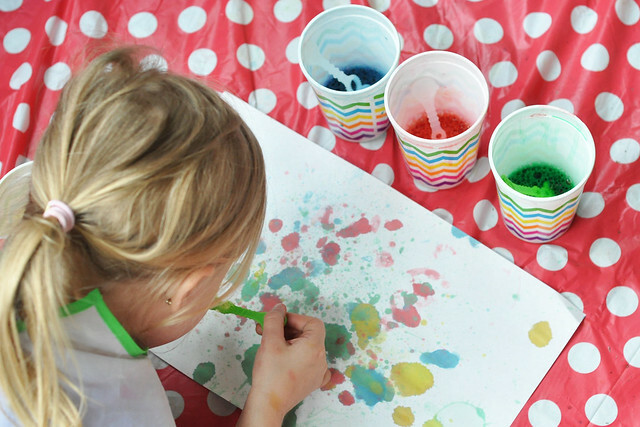 When Lexie was in preschool and Kindergarten, she LOVED to paint with bubbles. At that time, Lily was too young to join in, but she's at the perfect age now. 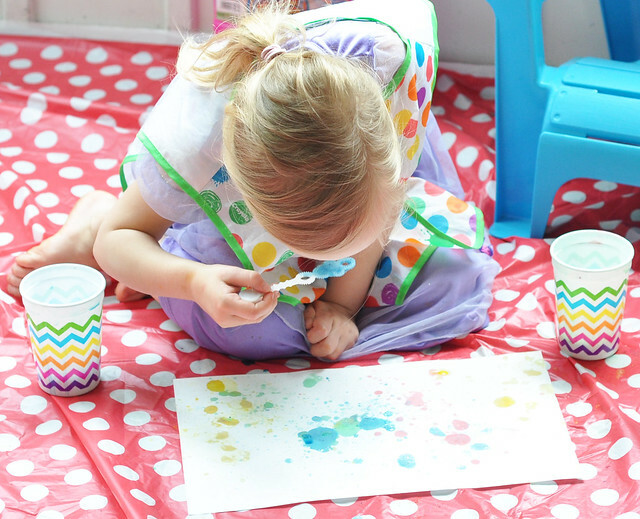 Yesterday was rainy and boring, so I introduced Lily to the fun of painting with bubbles! 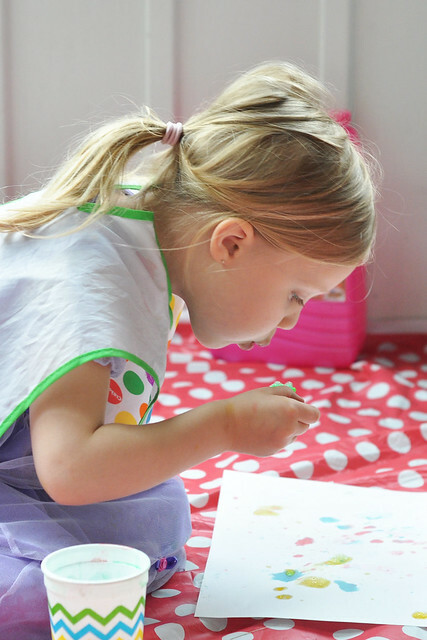 The supply list is small, and if you have kids, you most likely have these items already! 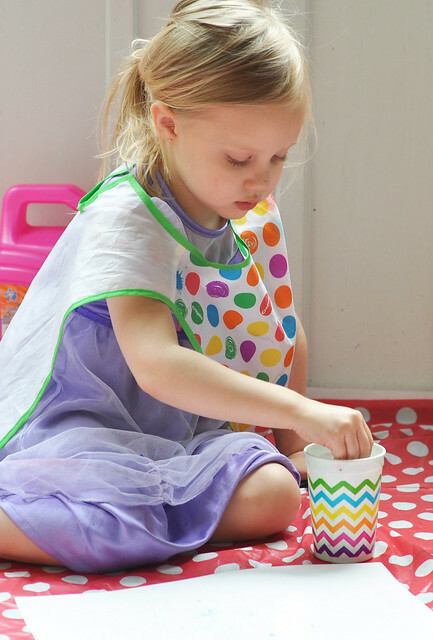 To keep the mess to a minimum, I highly recommend using a reusable plastic tablecloth and a smock! 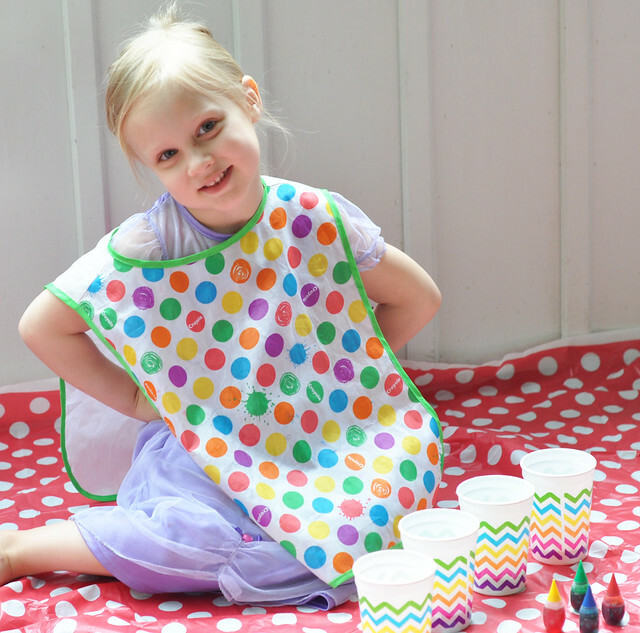 I chose to do the activity on our sunporch, but outdoors is a great option, too! 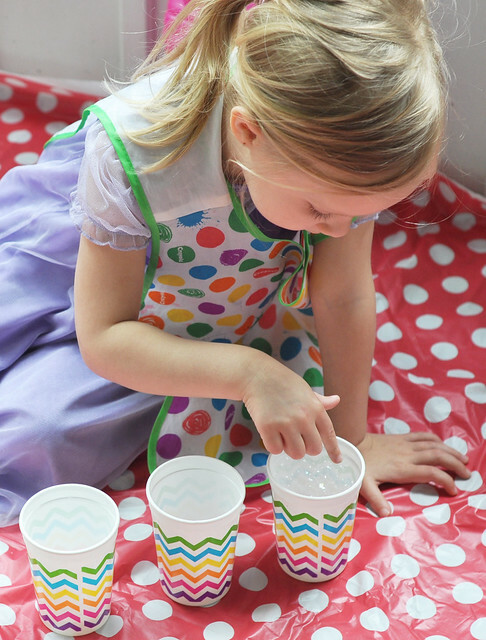 Pour bubble solution into cups. 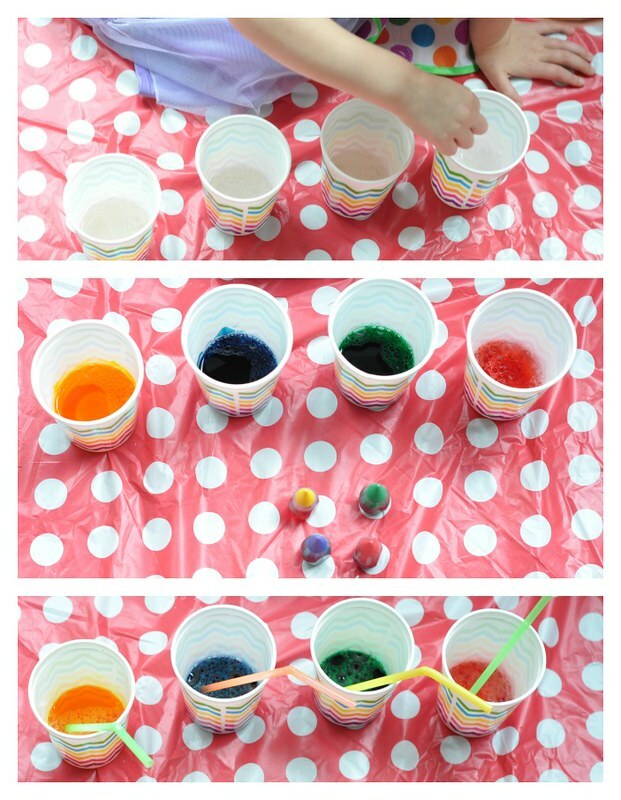 Put several drops of food coloring into each cup. Put a straw into each cup and stir! Now, you're ready to paint! This is the fun part! 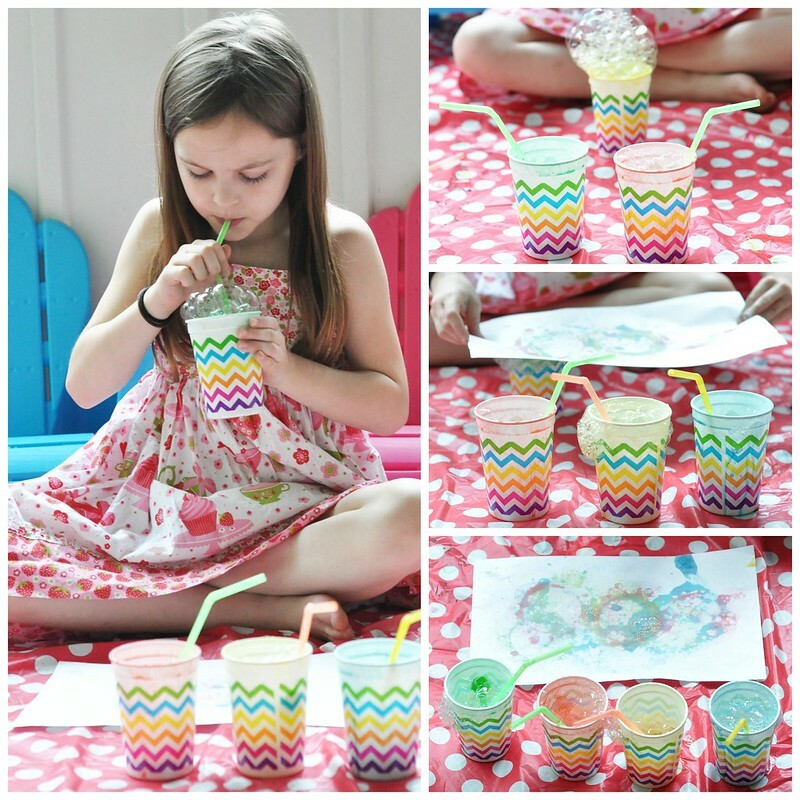 Get your paper, choose a cup, and blow into the straw until the "paint" bubbles over the top. 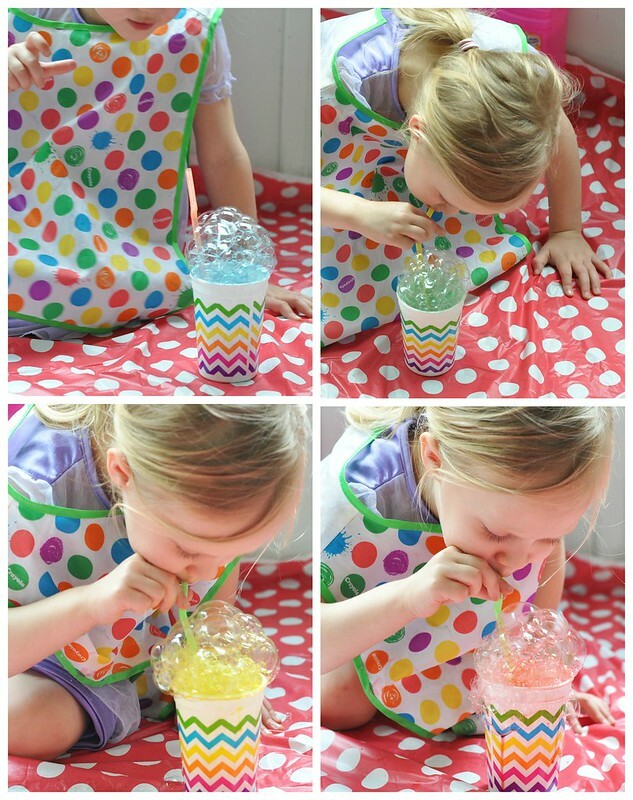 If your child is old enough to blow into the straw to make bubbles, they will love to do this. 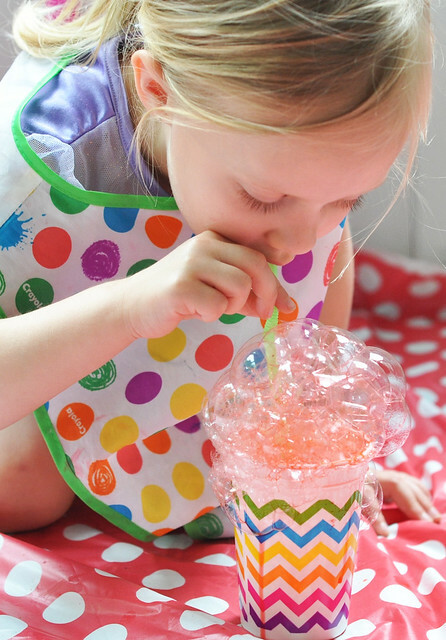 If you think your child will accidentally drink the bubble solution, do it for them! 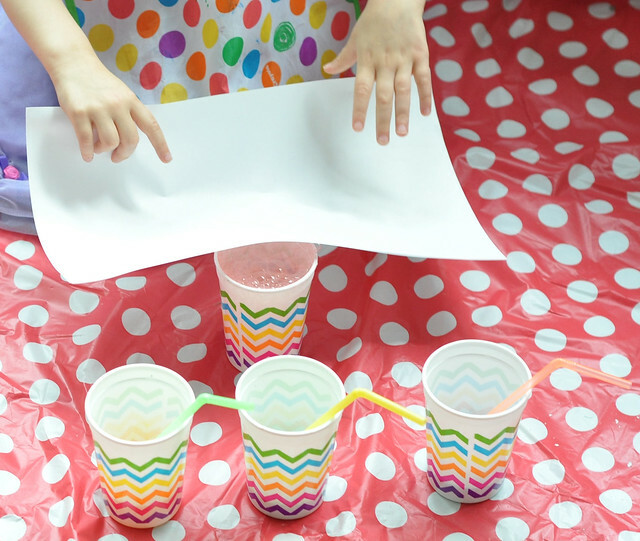 Once it bubbles over, quickly remove the straw and set it aside, grab your paper, and POP! 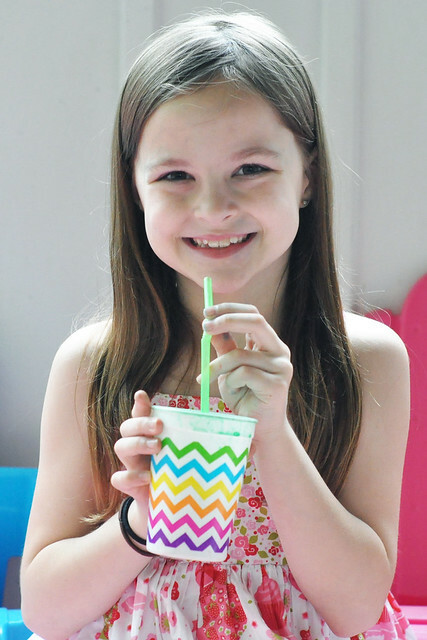 Lily's favorite part, obviously, was making the "paint" bubble over the top of the cup! Repeat the process with each color until the paper is filled up! 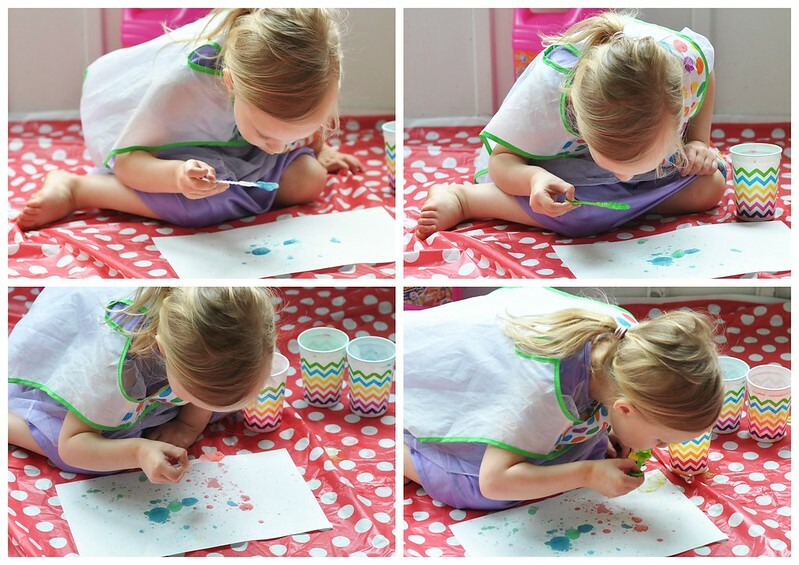 After Lily finished her painting, we moved on to blowing the bubbles onto the paper. Just swap the straws for bubble wands! 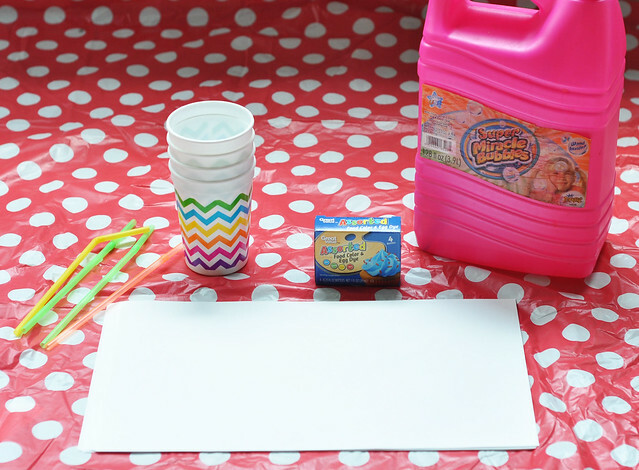 Grab a new piece of paper, dip the wand, and blow the bubbles down onto the paper! It's fun to watch the bubbles pop on the paper and see the different colors emerge! Blowing bubbles onto the paper was Lily's favorite. 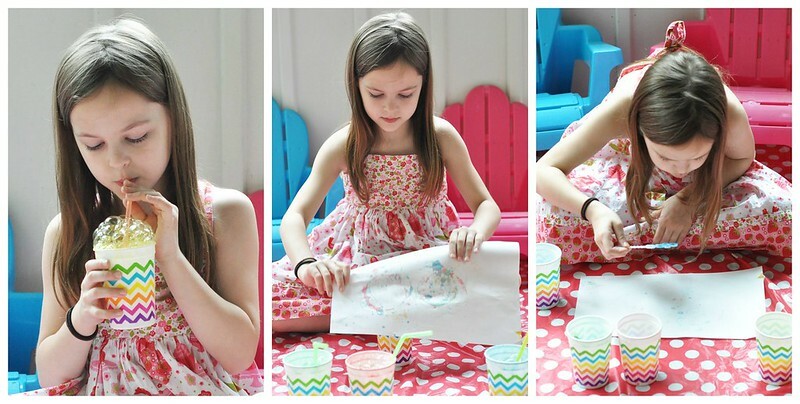 She happily created picture after picture! It was a rainy day success! And, of course, when Lexie got home, she had to join in! We are going to try this! I love this idea. I really need to get caught on your family. I have fallen so far behind all of my favorite blogs. Trust me, I completely understand! How fun, I'll have to try this with my girls. So much fun! My girls would absolutely love this! They are at the perfect age for it! This is awesome!! Definitely going to try this over the summer. Thanks! I hope they love it!!! I know our girls are close in age, so I'm sure they will! Pretty fun idea! Thanks for sharing. So my question is - does it stain skin? clothes? Thanks! I think the soap in the bubble solution helps. Lexie had it all over her hands and a few spots on her face and it washed off easily. 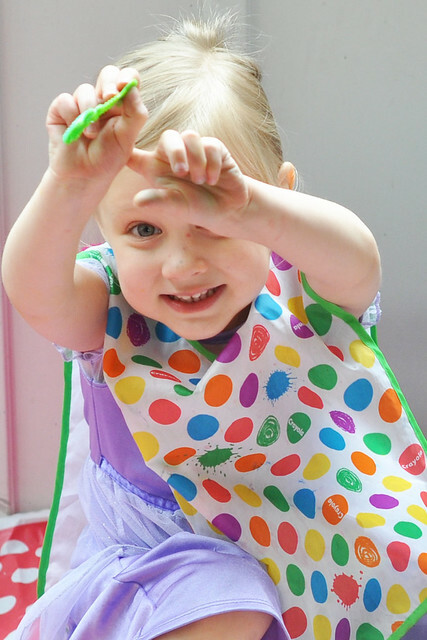 I would definitely recommend a smock, but it did wash out of Lily's dress! Very neat, I'll have to keep this one in mind. They loved it. I'm sure your kids would, too! Thank you! Dylan's preschool class did this 5 years ago, so we started doing it at home, too! What a great idea! I'm sure Lewie would enjoy blowing the bubbles over the cup! What kid doesn't like making bubbles w/ a straw. Your two girls are so precious! Such a fun idea (and we definitely have all these items already!). Thank you for sharing at Waiting on...Wednesday! I can't wait to get my girls to do this!